You can find the recipe for this meat loaf with mushroom gravy here. Whether basic or dressed up, glazed or plain, cooked in the oven or in the slow cooker, there are many kinds of meatloaf. These four universal principles can improve any meatloaf. Skip the Meatloaf Mix: Not every store carries meatloaf mix, a combination of ground chuck, pork, and veal. Plus, the mix is inconsistent from store to store, and different ratios of meat and different fat percentages can affect how a recipe works. Buy ground beef and pork separately, and omit the harder-to-find veal altogether. Use a Panade: Panade, a mixture of bread or cracker crumbs and liquid, helps keep meatloaves (and meatballs) moist. As meat cooks, the proteins shrink wringing out moisture. The panade interrupts the meat’s protein network, discouraging it from linking into a tough matrix and squeezing out liquid. Also, the starches in the panade form a gel, which traps moisture and fat inside the meat. The pieces of chopped mushrooms also work this way. Precook Aromatics and Vegetables: No matter how long meatloaf bakes, aromatics and vegetables that are added raw will always taste raw. Sautéing the onion, garlic, and any other vegetables before incorporating them into the raw meat mixture improves their taste and texture. Lose the Loaf Pan: Meatloaves made in loaf pans stew in their own juices, making their bottoms greasy and mushy. Avoid that by baking meatloaf on a baking sheet or, as we do here, in a skillet. 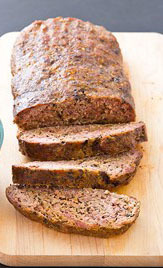 Our method allows the excess moisture to evaporate, keeping the meatloaf from stewing or steaming. Also, when baked in a skillet or on a baking sheet, the meatloaf can form flavorful, browned crust on the sides.